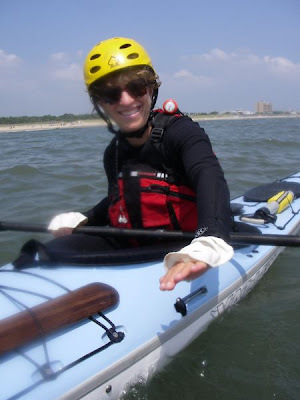 have kayaks, will travel: Stuff we love, part one: Sun protection! One of the tricky aspects of kayaking is protecting yourself from the sun. We slather on the sunscreen and SPF lip balm, and we still get burned. We're simply exposed to too many hours of direct sunlight. This summer, each of us discovered a favorite garment that kept us happily protected day after day in the sun. 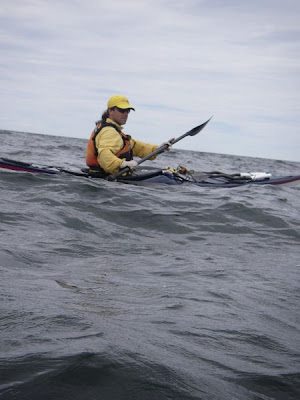 For Alec, it was the long-sleeved Kokatat Destination Paddling Shirt. It worked exceptionally well protecting him from the sun from the wrists up and had good underarm mesh ventilation. The surprise was that it kept him comfortably cool in hot weather and didn't cool him off too much in cooler weather. (We've both discarded polypro shirts that failed too miserably in one or the other of these situations.) And it looked pretty darn presentable at the end of the day. The long-sleeved Destination Paddling Shirt proved more versatile than we expected. For Sharon, it was the Destination Hand Covers. These inexpensive mitts (about $13) fully protect the backs of your hands but don't interfere with your grip on the paddle. One of our paddling friends was skeptical that they'd stay on in surf. But when Sharon pitchpoled her boat later that day, she lost her sunglasses but not her hand covers. The mitts stayed on and stayed out of the way. The sun-protection challenge we haven't yet solved is our lips. Even high-SPF lip balm doesn't seem to do the trick. Sharon has taken to applying regular sunscreen that contains titanium dioxide, but even that hasn't proven sufficient. Anybody found a good way to keep from burning their lips? Please let us know.